The Crimean Tatar population following Russian annexation is under renewed pressure. As a new history of the community shows, their troubles have many historical precedents—rooted in Russia's first annexation of the peninsula. Following Russia’s annexation of Crimea in 2014, Crimea’s indigenous community faced a new level of threat and discrimination from the annexing regime. Crimean Tatars were the most vociferous—or at least visibly vociferous—opponents of annexation. Historically, too, Crimea’s Tatar minority had aligned with post-Soviet Ukraine against pro-Russian movements within Crimea. In the summer of 2014, Crimean Tatar leaders Mustafa Dzhemilev and Refat Chubarov, were barred from entering Russian territory including Crimea for five years following accusations of extremism. With violence towards Crimean Tatars on the increase, including a raid and forced closure of the Mejlis (Crimean Tatar representative council) and Crimean Tatar media, Crimean Tatars comprise a significant proportion of those who have fled since Russia’s annexation. Crimean Tatars have come to fear exile, or even another deportation. This echoes the trauma experienced by Crimean Tatars’ Sürgün (deportation) in 1944, when the population was deported to Siberia and Central Asia in 1944 at the behest of Stalin. The order was taken to punish Crimean Tatars’ for betrayal of the Soviet motherland due to alleged collaboration with the Nazis, who occupied Crimea from 1941 to 1944. Many Crimean Tatars managed to return to their historical homeland only after 1989. Williams’s second book on the history of the Crimean Tatars, The Crimean Tatars: From Soviet Genocide to Putin’s Conquest, offers a timely and rich historical account of this community, stretching from Crimea’s annexation from the Ottoman empire to the Russian Empire in 1783 to the present ‘second annexation’ of 2014. It offers a historical context, if not haunting reflection, on the brutalities experienced by Crimea’s indigenous minority, of their ‘forced exile, genocide and revival as a nation’, at a time of great uncertainty, as well as the effect of these traumas on the national identity of this community. Williams’s narrative follows two central themes: firstly, of the building of a Crimean Tatar nation and sense of homeland, and secondly, the modernising transformation of Crimean Tatars, from a ‘pre-modern tribal-Islamic peasant people’ to a ‘modern secular nation’ in a matter of decades. Williams contextualises the fears and worries of Crimean Tatars, residing now in Russia after a period of revival since the collapse of the Soviet Union, countering the enduring assumptions that Crimean Tatars might be a source of religious fanaticism. The Crimean Tatars, he stresses, have endured as a secular and peaceful community and nation, in spite of the numerous challenges posed by the deportation. This argument has increasing relevance since annexation, demonstrating the absurdity of Russia’s treatment of Crimean Tatars, depicting them as religious extremists, and including accusing Crimean Tatar leaders as recruiters for ISIS. This history follows the pre-Tsarist period to the contemporary period, to discuss how a diasporic nation came to be constructed and how it endured despite the challenges of deportation. Williams spends the first three chapters focusing on precisely how Crimean Tatars did not conceive of themselves as a nation, beginning his historical narrative with the Crimean Tatars’ dispossession—their loss of a homeland to the Russian Empire in 1783. This annexation caused micro-level changes in terms of property rights, contrasting the traditionally freer Crimean Tatars with a landowning Russian elite, who confiscated land from them, encouraged the Muslim minority to migrate en masse to the Ottoman Empire. Those remaining fell victim to the suspicions of the Russian Empire, as religious fanatics and potential collaborators with the ‘invaders’, in a context of rising tensions between the Russian and Ottoman Empires culminating in the Crimean war of 1854-1856. Even in this period, the idea of mass expulsion of Crimean Tatars was considered, although as Williams argues it was not pursued due to a lack of logistical capacity. These rumours continued to circulate, however, and were successful in scaring Crimean Tatars to emigrate voluntarily. In the nineteenth century, an emerging Crimean Tatar intelligentsia constructed the peninsula as a vatan (homeland) for Crimean Tatars and transformed the population from a religiously-defined politically apathetic minority into a secular and politically active nation with a clear sense of territorial attachment. Williams argues that local intelligentsia were responsible for this transformation, in particular the cultural hero of Ismail Gasprinsky, the so-called ‘father of the Russian Turkic Nation’. Gasprinsky sought to modernise and reform Crimean Tatar society, through education and newspapers, from an inward looking and conservative community to a secular nation. Gasprinsky was concerned too with self-preservation, supporting an international pan-Turkic affiliation between Crimean Tatars and Muslims across the Russian Empire which centred on a common language, culture and ethnicity (rather than a common religion) and opposing emigration. This was a watershed in Crimean Tatar history and marked the creation of Crimea as a territorial home for the Crimean Tatar nation. Williams emphasises the role of Soviet policies in creating and shaping the Crimean Tatar nation, and the different dynamics of Soviet policy under Lenin and Stalin. The Crimean Tatars were crucial in helping the Bolsheviks capture the Crimean peninsula from the Whites during the Russian civil war. After a policy of repression by the emerging Soviet regime, the Soviet Union changed tactics and instead supported a policy of supporting Crimean Tatars—as the indigenous peoples of the territory—in line with Lenin’s policy of korenizatsiya (indigenisation). The Soviet state promoted the flourishing of Crimean Tatar language, education and culture, though equally pursued a policy of secularisation, leading to the closure of mosques in Crimea. During this period, Crimean Tatars such as Veli Ibrahimov—chairman of the Crimean Central Committee—were empowered, pursuing policies to increase the population of Crimean Tatars and to resettle them away from over-populated coastal areas north of the Crimean Steppe. 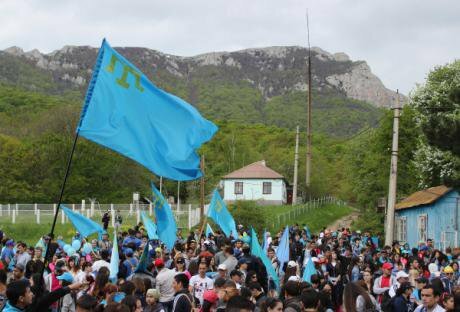 Crimean Tatars at Chatyr-Dag commemorate the 71st anniversary of the deportation, May 2015. (c) Yury Lashov / Visual RIANWith Lenin’s death and the rise of Stalin, the approach of the Soviet Union to the Crimean Tatars shifted dramatically. Ibrahimov fell victim to the first wave of purges under Stalin in 1928 and waves of deportations of Crimean Tatars to Siberia began in the early 1930s. Moving towards the second world war, Williams discusses both how antipathy Crimean Tatars towards Soviet rule was already high and unpacks the complex experiences of Crimean Tatars during Crimea’s occupation by Nazi Germany. Crimean Tatars fought and died in the struggle against Nazi occupation and, after their capture, some were forced into fighting with Nazi soldiers. Williams complicates the collaboration accusation put forward by Stalin, highlighting coerced collaboration and significant wartime losses, where up to 20,000 Crimean Tatars died fighting within the Soviet army. The Sürgün in 1944 saw the deportation of almost the entire population of Crimean Tatars following the liberation of Crimea from Nazi occupation, Williams's analysis of the events centres on national identity, noting the ruthless rationale of Stalin’s actions. The deportation was to deterritorialise—and thus denationalise—Crimean Tatars. However, the consequence of this communal trauma was instead to converting a latent national identity into a site of mobilisation and politicisation. The risks of politicisation were something Crimean Tatar activists were willing to bear throughout the Soviet period. Many were imprisoned, notably former chairman of the Mejlis Mustafa Dzhemilev Qırımoğlu (Crimean Tatar: ‘son of the Crimean nation’) as they waited out the Soviet experiment in exile unable to return until the final years of Gorbachev’s policies of perestroika and glasnost. With the return of Crimean Tatars to Crimea in 1989, Williams argues the diasporic identity of this nation and their attachment to the territory of Crimea were crucial to the endurance of a Crimean Tatar identity. This identity was passed down through generations via folklore and myths about the territory and the transgenerational and shared nature of the Sürgün trauma. Those returning to Crimea were willing to sacrifice their standard of living in returning to a peninsula in which they were marginalised to rural and urban peripheries, self-made shacks in self-made settlements, often without running water, electricity and toilets. This process of deurbanisation, Williams adds, also affected the employment opportunities of those returning, with white collar workers becoming market traders. This communal experience of trauma, post-Soviet return and renewal was the backdrop for Russia’s annexation of Crimea in 2014. New struggles began for the Crimean Tatar community. The occupying Russian regime was suspicious of the community, not only because they were consistently pro-Ukrainian minority, but due to an entire history of distrust which began with the ‘first annexation’ of 1783. The resonance of the book is a testament to the richness and depth in which it covers Crimean Tatars’ history. Williams constructs a fascinating narrative and a convincing argument on the strength of deportation as a communal trauma, which served to preserve a nation in exile and incentivise return, even though this incurred significant personal costs. Williams has a particular interest in the slur of Crimean Tatar ‘betrayal’—which is still used to delegitimise the community. As he notes, this accusation preceded Stalin’s 1944 denunciation of the Crimean Tatars, and had its roots in the ‘first annexation’ and then the Crimean war of the 1850s. It was unclear therefore whether the author intended to draw parallels between these periods, a point which Williams could have addressed more directly. The Crimean Tatars’ expertise with the land in Crimea—in particular their skill for water conservation—was also briefly addressed by Williams. In a peninsula notoriously short of this precious resource and in a political climate where—since annexation—Ukraine has halted water supplies to Crimea, this point could also have been developed further. For example, one potential reason suggested for Khrushchev’s transfer of Crimea to the Ukrainian SSR in 1954 was Crimea’s reliance on water supplies from Ukraine, via the Dnieper. How far this reliance on Ukraine increased following the deportation of Crimean Tatars would then have been an interesting point for Williams to consider. Williams projects a precarious future for Crimean Tatars: one in which they will likely remain a source of suspicion, at risk of continued discrimination and marginalization. If anything should be taken from his pessimistic history of the community, it is that the Crimean Tatars show incredible durability as a peaceful nation, even in exile. To this end, however tragically, Crimean Tatars may not need Crimea as a territorial homeland to endure as a nation. 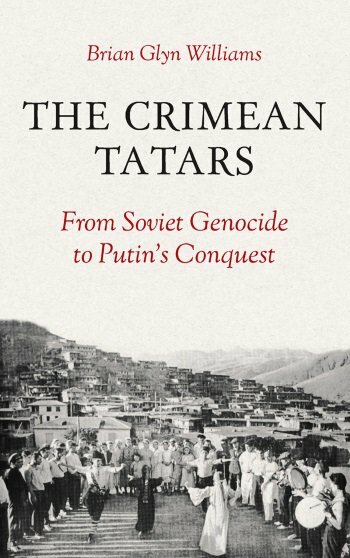 Brian Glynn Williams's The Crimean Tatars: from Soviet Genocide to Putin's Conquest was published by Hurst in November 2015.